In all cases of intestinal obstruction, the intestine involved is carefully examined. 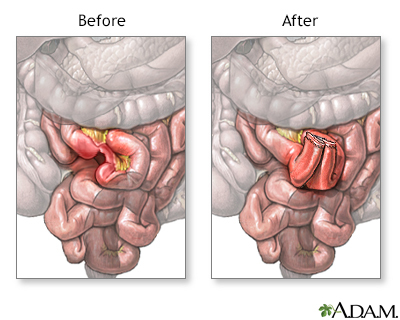 If any parts of the intestine look unhealthy from lack of blood flow during the period of obstruction, they are removed and the healthy ends are reconnected. A patient's recovery depends on the cause of the intestinal obstruction and the length of time prior to relief of the obstruction. The outcome is usually good if the obstruction is treated before damage (ischemia) or death (necrosis) of the bowel occurs.